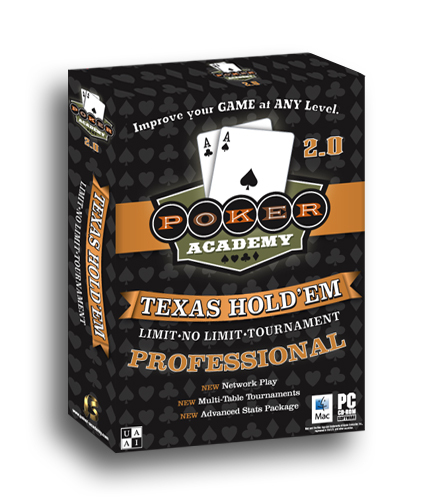 Poker Academy Pro Texas Hold 'Em 2.0 Debuts. First Texas Hold Â?Em Poker Software to Feature Online Play and Chat, Multi-Table Tournament Simulation. Company to Launch Its Flagship Game and Poker Training Software at the World Series of Poker Consumer Lifestyle Show in Las Vegas, July 6. Booth #831. Poker Academy, a leading developer of poker software products (http://www.poker-academy.com), today announced the upcoming debut of Poker Academy Pro Texas HoldÂem 2.0, which utilizes world-renowned artificial intelligence developed over more than 10 years. Designed for the serious player, Poker Academy Pro 2.0 is the first Texas HoldÂem poker software product to feature online play and chat as well as multi-table tournament simulation, like the World Series of Poker circuit and World Poker Tour, as seen on TV. Poker Academy will launch its flagship game and poker training software at the World Series of Poker Consumer Lifestyle Show in Las Vegas, Nevada at trade show exhibit booth #831. The event runs from July 6 through July 9. Poker Academy Pro 2.0 is available for sale online at http://www.poker-academy.com and select retailers. Poker Academy is a leading poker software developer. The Company develops the worldÂs most advanced Texas HoldÂem poker learning tool, utilizing world renowned artificial intelligence developed over 10 years. 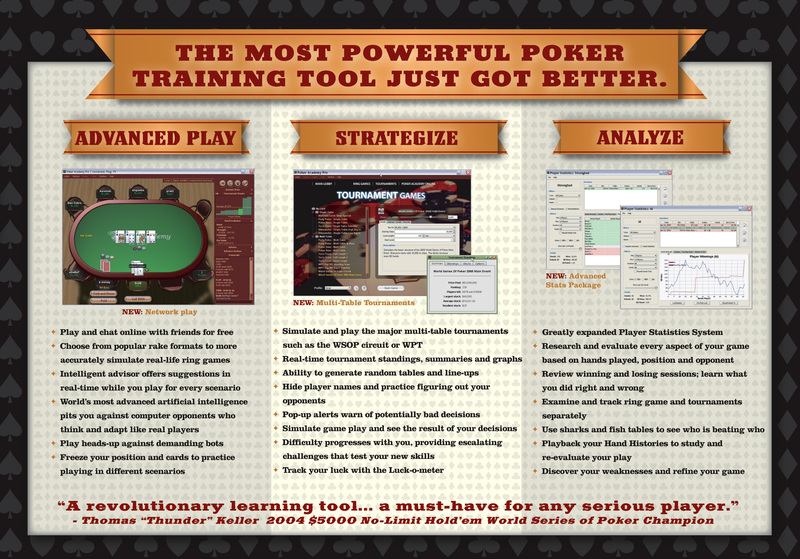 Poker Academy software is designed to help players learn, adapt and improve their poker skills. Poker Academy includes No Limit, Limit and Tournament play along with many feature-rich components. Poker Academy is headquartered in Edmonton, Alberta, and has U.S. offices in Minnetonka, MN. For more details, please visit http://www.poker-academy.com. The All New Poker Academy Pro 2.0 The most powerful poker training tool just got better, featuring play/chat online, multi-table tournament simulation, and an advanced palyers stats package. A Look Inside the Poker Academy Pro 2.0 SoftwareImprove your game at any level through advanced game play, extensive poker strategies and detailed analysis.